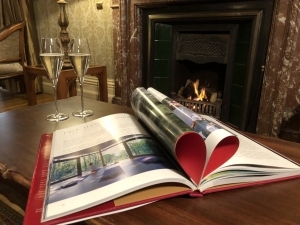 From February 9th-17th the Do Not Disturb package at the Park Hotel Kenmare is the ultimate Valentines escape. Celebrate a luxurious romantic escape with someone special and you never know what Cupid will have awaiting your arrival. Do Not Disturb package comprises of Two Nights Deluxe Accommodation, Full Irish Breakfast each morning either in your room or the elegant surrounds of The Dining Room, Dinner on one evening in our Fine Dining Restaurant or curled up in a fluffy bathrobe in the sitting area of your room, Saturday Morning Hike on the Kerry Way, participation in our This Week at SÁMAS Lifestyle Classes such as Yoga, Pilates, Garden Walks, Meditation or a Classic Movie in The Reel Room. To add something really special indulge and treat that someone special to a SISLEY Treatment at our Deluxe Destination Spa, SÁMAS. Do Not Disturb package prices from €300 per person sharing, SISLEY treatments from €95. Rates include VAT and accommodation for up to two adults and two children. The promotion cannot be combined with other offers.